Growing up, all Brian Sharp ever wanted to do was to serve his country in the United States Air Force. Though he was able to live out his dream for fourteen years, that dream came to a devastating halt when he received an ankylosing spondylitis diagnosis and was forced to medically retire. However, Brian, whose nickname is “Saltlife Runner,” refused to be defeated. He became an avid runner and passionate coach that has helped hundreds of athletes achieve their running dreams, which ultimately brought back joy and meaning to his life. Brian, now 46, was diagnosed with ankylosing spondylitis at age 23, a severe form of arthritis that typically causes inflammation of the spine. It took him decades to find medications that stopped the progression of the disease, and during this frustrating trial and error period, many of his joints fused together and lost their full range of motion. Brian was devastated to lose his health and was equally distraught when the United States Air Force deemed him unfit for military service. After losing his beloved job in the Air Force, Brian felt like he lost a critical part of what made his life meaningful and spiraled into a deep depression. As his physical condition continued to decline, his emotional state worsened, too. His relationships with his family suffered greatly and he gained over sixty pounds. His health continued to plummet downward until he looked in the mirror one day and no longer recognized himself. At that moment, he knew it was time to take charge and change his life. In 2010, Brian began his inspiring fight against arthritis. On a whim, he signed up for a 10K Turkey Trot, without training or even knowing how far the distance was. After waking up early with his blood pumping with adrenaline, he finished the race in severe pain and exhaustion, but with a deep satisfaction that he had not felt in years. He craved that feeling of joy again and signed up for even more races. What was supposed to be a one-time Thanksgiving-day race turned out to be the beginning of a brand new, healthier life filled with meaning and purpose. As Brian started his new life as a devoted runner, he lost over sixty pounds and shed his feelings of self-doubt. As he moved forward, he became enthralled with the sport of running. To date, he has completed an impressive 61 races, including one full marathon and 14 half-marathons. Racing helped Brian develop a more positive outlook on his disease and better equipped him to manage it. Wanting others to experience the same fulfillment in running as he did, Brian began coaching fellow runners at Fleet Feet Sports in San Antonio, TX. Over the past three years he has helped over 300 athletes achieve their running dreams. Inspired by ANRF Ambassador Britt “Hurt Blogger” Johnson, Brian joined Racing For a Cure to give new importance to his future races. Brian knows first-hand how his medications have given him the gift of being able to move, run, and function normally. 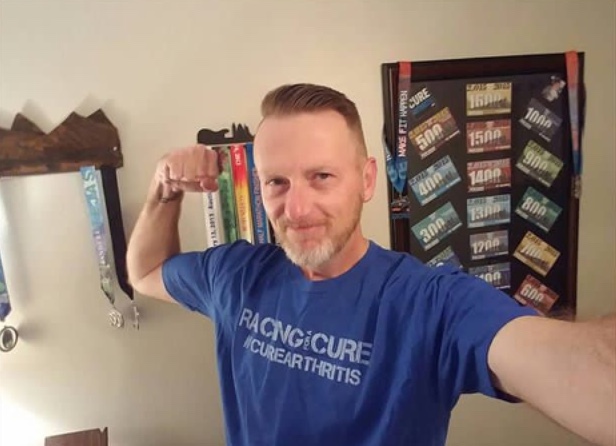 He is thrilled to be racing to support arthritis research at ANRF, where scientists can continue developing effective treatments and eventually find the cure for arthritis. When Brian was forced to retire from the Air Force, he thought that the best years of his life were in his rear view mirror. Now, he is not afraid to look forward, as he believes that the best is yet to come. What have you been able to achieve despite your arthritis diagnosis? Share it with us in the comments below! I met this amazing man while on our 1 year remote assignment to Kunsan Air Base, Korea in 1991. I mentored him in our career field of Supply. We went our separate ways and he cross trained into Logistics Planning, where he rose to the top. Late in my career I happened to cross train into the same career field where he then mentored me! He is a one of a kind person who will do whatever it takes to reach his goals. I am honored to know him. Inspiring story! Congratulations and best of luck with future endeavors Brian.